Last year when Gartner released their Magic Quadrant for Unified Communications as a Service, UCaaS was just beginning to creep its way into the mainstream. Gartner explained in the report that the current UCaaS offerings were just beginning to add increased functionality to rival the on-premises based alternatives. With key improvements in the user experience, API connectivity and even mobile focused deployments, Gartner made it clear that UCaaS was on the way up, and quickly. Fast forward to the current year of 2016, and we have another year of UCaaS development behind us, and another UCaaS Magic Quadrant report from Gartner to outline the strongest players, and even the cautions that come which each VoIP provider. Safe to say, UCaaS has now entirely moved to the mainstream, and has become a completely viable alternative for almost all enterprise deployments, according to Gartner themselves. With a strong focus on the players that provide a strong global capacity, the technology research and advisory firm compiled this year’s list of UCaaS Leaders, Challengers, Visionaries and Niche providers. We decided to take a look at both the 2015 and the just released August 2016 reports to shape a better understanding of how the market stands, how it has grown, and what moved around since last year. To help us shape a stronger understanding of the report, it would be helpful to have an idea of how a provider might even find themselves on the list. In order to have a chance to appear on Gartner’s Magic Quadrant report, the providers must complete and submit a lengthy questionnaire to provide information about their Company in general, specific UCaaS products, offerings, and solutions. As the report explains, Gartner looks for the Completeness of Vision, and Ability to Execute in each of the provider’s focus. In order to qualify as Unified Communications, a provider must be able to include information surrounding specific solutions such as Voice and Telephony, Audio, Video and Web conferencing, Presence and Instant Messaging, downloadable Clients, and Communications-enabled applications. Of course, being UCaaS, this must also all be hosted within the cloud. Providers must answer the questionnaire with 500 word responses to outline and explain their solutions, and how they fit into the UCaaS model, as well as contract, employee, network environment and structure information. A Tier 1, global network service provider headquartered in London, U.K., BT found themselves in a good position in 2015, but moved up to an even better spot in 2016. With the acquisition of the mobile operator EE, who was previously joint-owned by Deutsche Telekom and Orange Business Services, BT managed to bring in just what they needed. With dual data centers for their UCaaS infrastructure in Europe, North America and Asia/Pacific, and both Cisco HCS or Microsoft S4B solutions, BT continues to innovate its service in new ways. 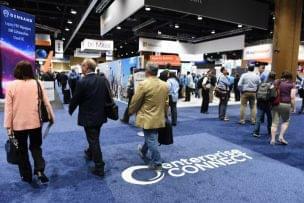 The acquisition of EE provided a massive boost, one mostly responsible for their gain in a position from Challengers to Leaders, with plans for integrated mobile UCaaS offerings as well as extra investments in User Experience, online portals, and the APIs available to connect the BT service with other popular apps. Gartner also reports BT has managed to win large accounts, some even upwards in the 50,000 employee range, and leverages Esna to enable APIs to major cloud apps like Salesforce, Cisco Jabber, and Google Apps for Work. Combine an already solid network, a healthy clientele base, robust service and offerings with the increased functionality gained from the EE acquisition, and it’s easy to see why BT managed to claw their way into the Leader’s category. NTT Communications is a bit unique in that the provider combines the UCaaS capabilities of the Japan-headquartered NTT Communications, with the France-based Arkadin, which NTT managed to acquire back in 2014. 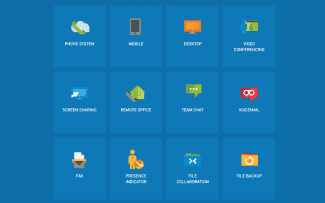 Both companies focus on delivering UCaaS services, with NTT Communications offering a solid solution for larger enterprises seeking Cisco UC technology, and Arkadin Total Connect offering midsize businesses a Microsoft based UC solution. So between the two, NTT is able to provide any size business with any form of solution they need, whether that be Cisco or Microsoft based. Leveraging these already established foundations allows NTT to focus on the deployment and service offered. However, with NTT based in Japan, and Arkadin based in France, the provider has a strong focus in the Asia/Pacific market, positioning the provider to be most suitable for companies that have a significant presence in the Pacific region. I feel this has held NTT back from becoming a Leader, as a stronger global presence in the North American and European markets would help push them even further in the quadrant, but with the proven ability to support very large enterprises above 20,000 employees, and investments in developing a NTT specific web portal, web-based APIs to integrated Google and Microsoft IT productivity stacks, as well as IT portals in seven languages, NTT managed to jump from a Niche provider in the Asia market, to a Challenger in the world market. Previously on the list in 2015 as ThinkingPhones, the company recently acquired provider Fuze in just the 4th quarter of 2015. Since, completing a consolidation and rebranding in 2016, Fuze – who was formerly ThinkingPhones, but was acquired by Thinking phones – has managed to climb their way up the Magic Quadrant. Moving from the Visionaries category to now standing as Leader in the global market, Fuze gained a lot from their consolidation and rebranding. 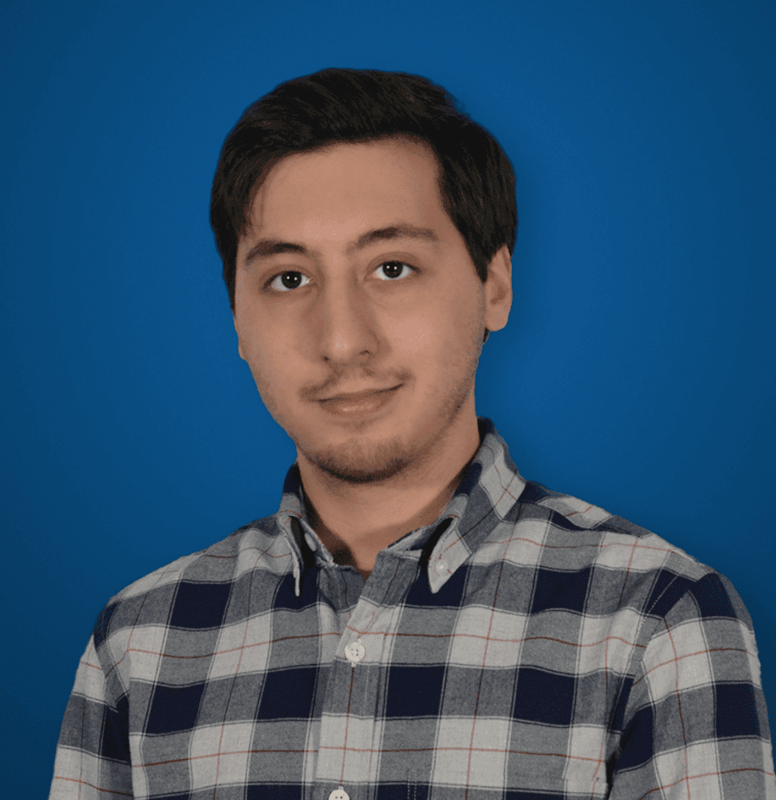 A proprietary, multi-tenant platform that includes web-based APIs for UC integration, as well as expanded international capabilities, Fuze positioned themselves as a strong leader in new markets. Following the rebranding, the provider has since expanded their global presence to include new data centers in Europe, doubled their headcount to nearly 100 employees, and now also supports the Asia/Pacific market with data centers in Singapore, Hong Kong and even Sydney. According to the Gartner report, Fuze has a core value proposition based on improving business processes, providing a solution more complex than most UCaaS developments. Looking back at the 2015 Magic Quadrant, ThinkingPhones was considered a visionary for the exact same mission statement, yet only managed to jump to the position of a leader now that the acquisition, consolidation and rebranding into Fuze has provided a strong international offering. As a European based provider, with headquarters in London, U.K., Interoute has a strong grasp on the European market. With such a major focus on the European market, however, the provider found themselves dropping their position of Visionary to Nice, falling behind a number of other European based providers that have managed to grow their international markets. Although Interoute does in fact employ workers in 30 countries with supporting services in more than 130 countries, the fact still remains that Interoute has a strong focus on the European market. Their entire business is slightly skewed towards Europe, as Gartner put it, and while their UCaaS infrastructure is in fact available in the Asia/Pacific market as well as North America, the provider’s account base, brand recognition and even personnel are European based. So while the provider does have employees in 30 different countries, this all seems to be within the region of Europe. Although, it should be noted that the provider’s UC offering is based on their proprietary Interoute One set of services including voice, collaboration, conferencing, with multiple Skype configurations available, as well as contact center capabilities and a wide range of video services. Gartner goes on to explain all of these offerings are “complemented with Interoute’s SIP-based global Virtual Voice Network.” Interoute still remains in the Magic Quadrant, and supplies a robust and unique offering for just what Gartner labeled them as, a Niche market. Who Remained in the Same Quadrant? The majority of providers included in Gartners roundup actually managed to remain just where they are, with the Challengers remaining Challengers, and the Leaders remaining as the Leaders. A couple of Visionaries have stayed as well, seemingly unable to turn their ideas into a reality. One most notable provider that remained in the same position would be Mitel, who lost out the bid for Polycom earlier this year. 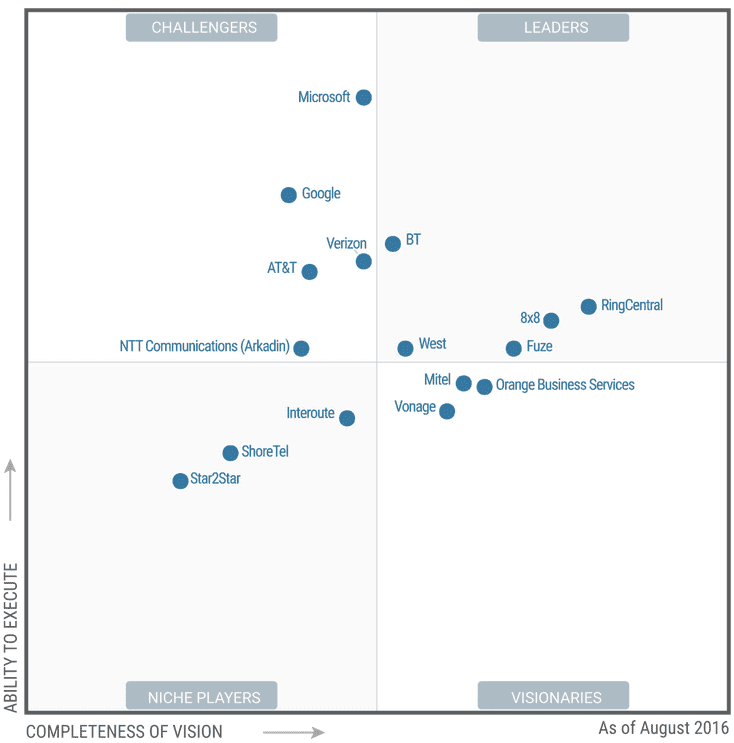 Mitel managed to stay put within the Visionaries, along with Vonage and Orange Business Services who didn’t go anywhere either. Mitel had acquired Mavenir Systems in 2015 to leverage mobile opportunities, and even introduced the collaboration solution MiTeam in early 2016, but Gartner explained that Mitel only providers service in selected Asia/Pacific markets. Vonage, who did manage to complete an acquisition in 2016, that of Nexmo, also remained a visionary due to a lack of support in the European market – something Nexmo will help them branch into, but has yet to come to full fruition. 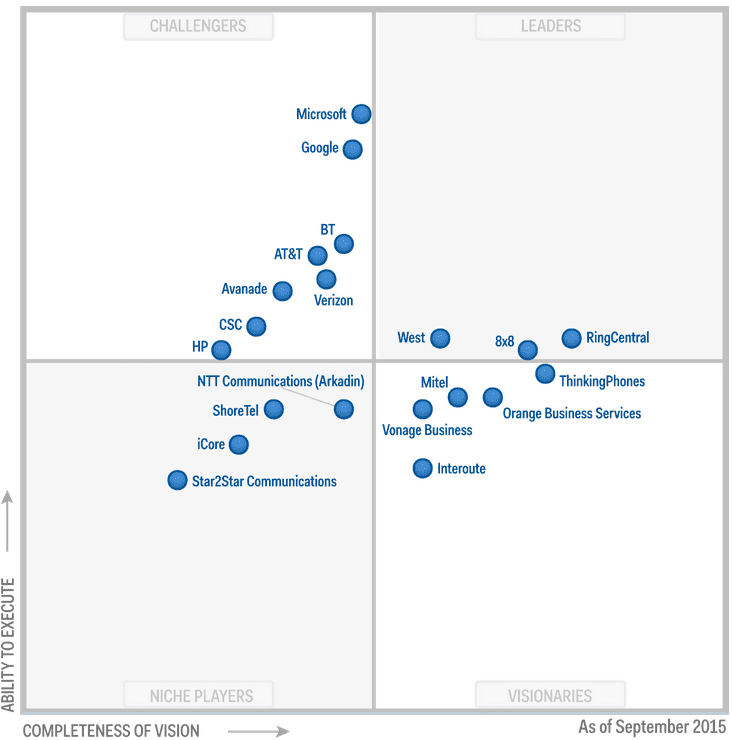 ShoreTel also managed to remain on the board as a niche player. Those that remained as leaders, 8×8, RingCentral (who leverages Google) and West, held their position due to overall robust offerings, services, solutions and global presence. It makes sense that Verizon, AT&T and Microsoft remain in the Challengers quadrant, as they all provide offerings with a strong backbone and solid global presence, but Google in my mind seemed to drop a little bit more than Gartner suggested. While they remained in the Challengers category, and I agree this is a fair place for them with the wide Google Apps for Work offering, a lack of Hangouts support in 2016 so far leads me to question their positioning slightly, along with the Alphabet reorganization. Gartner agrees, as the report explains that “Hangouts does not provide an enterprise voice capability,” and “Google Hangouts supports only 25 simultaneous web conferencing sessions.” Businesses with Google will find themselves outsourcing other functionalities, which leads me to believe that as a UCaaS provider, Google might fit a little better in the visionary category. They have a wide range of work and productivity tools, and they have the right idea there – but the execution doesn’t seem to be as robust as the other market offerings. Who Dropped Off the List? Vanished without a trace from the Gartner Magic Quadrant of UCaaS, the providers iCore, CSC, HP and Avanade are not included in the report for 2016. The list shrunk from 20 providers last year, to just the 16 included this year. The report does not make note of why these providers have fallen off the list, but that could range from the provider not applying, not completing the questionnaires, or simply not offering a solid enough platform in enough markets. Gartner’s Magic Quadrant reports offer an in-depth look at the current market and offerings available to not only the Large Scale Enterprises, but medium and even small businesses around the world. By comparing both reports from 2015 and 2016, we can shape a deeper understanding of the market, the trends, the maturity of the market, and also specifically analyze each provider and their moves. Comparing both years side by side can provide an overview to see what changes or moves fared what for what players, and who might have fallen behind slightly. If the Magic Quadrant alone is anything to go by, it is very evident that the market is maturing, and at a steady yet rapid pace. Shifting from the introduction of UCaaS to now a mainstream solution, in just a year the industry has come a long way with almost every provider completing some kind of major shift. Only time will tell how the market continues to grow, but it will grow and fairly quickly.